While some folks feared the 2GB of memory requirement meant an added bloat in Mac OS X Lion, many fans were pleasantly surprised seeing their Lion system perform faster and zip through daily tasks smoother compared to their previous Leopard or Snow Leopard installations. 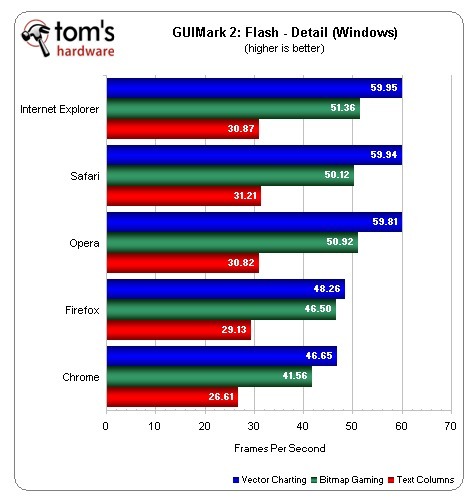 But how does Lion fare against Windows 7 in web-based tasks, including page loading times and common technologies such as Adobe’s Flash, HTML5 web apps and WebGL-accelerated graphics? Tom’s Hardware set out to figure out the answer to that. They put both operating systems through their paces in a series of tests run on the same hardware, so Lion was running on a PC machine rather than an Apple-branded Mac. The tests were conducted using the latest platform-specific builds of Chrome 13, Firefox 6 and Safari 5.1 for OS X Lion and Windows 7. On its native platform, Safari is definitely no slouch. In fact, the performance of Safari 5.1 in OS X Lion matches that of Firefox 6 in Windows 7. Mac OS X Lion is a beauty to behold, and its benefits aren’t just skin-deep. The score for Safari 5.1 on OS X is really close to Chrome 13 running on Windows 7, and it might even beat Firefox 6 for Windows. So, if you throw Safari 5.1 for OS X into the regular Windows 7 mix, Apple takes or shares second place.